Christopher and Eric present some of the most hilarious and entertaining highlights from their first celebrity interviews. Their special guests include world-famous novelist Anne Rice, famed prosecutor Marcia Clark, Broadway diva and T.V. star Laura Benanti and a special musical performance from comedian Alec Mapa. Along the way there’s delicious dish about about FIFTY SHADES OF GREY author E.L. James and gorgeous actress/model Amber Heard. 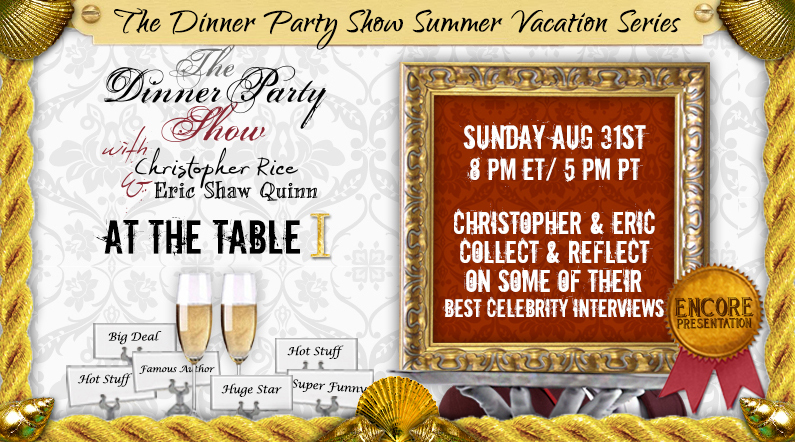 It’s a sparkling buffet of celebrity treats. Also being served up, Edgar Award winning mystery novelist Jan Burke, T.V. writer Chad Hodge, podcaster and entertainment guru Jack Morrissey and Patricia Nell Warren, author of the groundbreaking classic novel THE FRONT RUNNER.